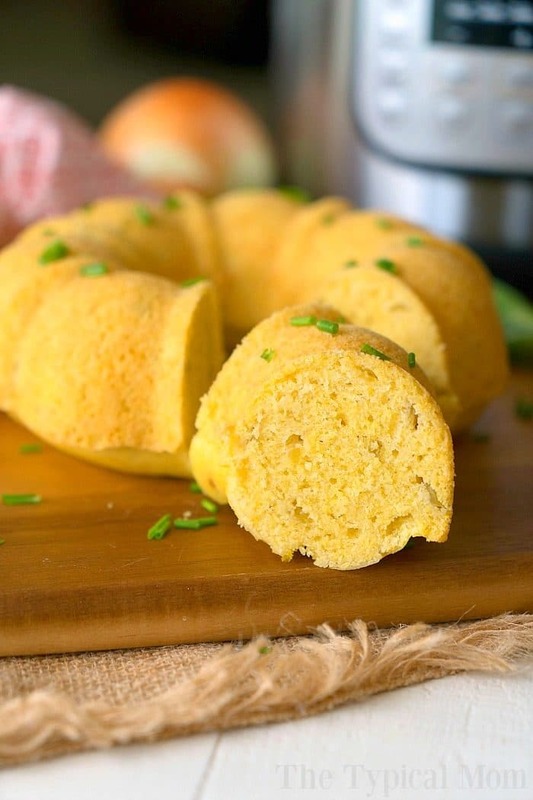 This pressure cooker cornbread is the perfect side dish for any holiday and perfect served with chili! 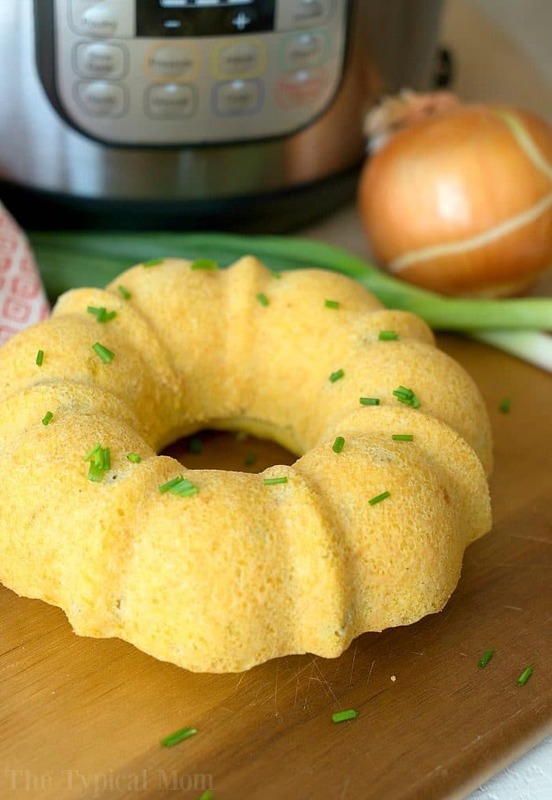 An easy homemade cornbread recipe cooked right in your Instant Pot and comes out so moist and pretty using this bundt pan. Add some chiles and even jalapenos and enjoy your favorite bread in no time at all. I used the recipe on the back of the Albers yellow corn meal box and added the can of chiles because I thought that would give it a wonderful flavor and it did. You can use any cornmeal mix to make pressure cooker cornbread really. I will say everyone has a preference when it comes to cornbread. One difference would be the add ins. 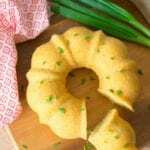 Want to make spicy cornbread? Add some diced jalapenos if you do. I don’t prefer that but still like added flavor so I like added a can of diced chiles to ours. It made our pressure cooker cornbread really flavorful. It came out really well the first time around even though I wasn’t sure of the timing. I put it in for 38 minutes and once it cooled was cooked perfectly thru as you can see here. If you prefer it moister you could set it for closer to 35 minutes. I used my mini bundt pan which is one of my Instant Pot accessory recommendations and it helps with cooking it evenly I think. When you use a springform pan instead the inside is going to be moister than the outer rim. I just think using this not only cooks evenly but looks really pretty when you serve it! I have a 6 qt. Instant Pot and this would serve probably 10-12 people as a side dish with 1 piece each, I wouldn’t add any more to the pan or it will overflow. Here is what you’ll need to make this easy pressure cooker cornbread + a video showing you how to make it. It pairs perfectly with our Instant Pot chili so try them both tonight! Add all dry ingredients into a bowl and mix well. In another bowl gently whip your egg and add your buttermilk and oil, dump this into your dry mixture and fold together gently until combined. Add can of diced chiles (makes it taste really good and not spicy if you use mild, medium is great too). Fold together. Spray the inside of your 6 c bundt pan (this will fit inside a 6qt and 8qt Instant Pot or other pressure cooker). Pour batter inside. Cover top of bundt pan with a paper towel and then with foil and seal around edges. Put a trivet inside your Instant Pot with 2 cups water. 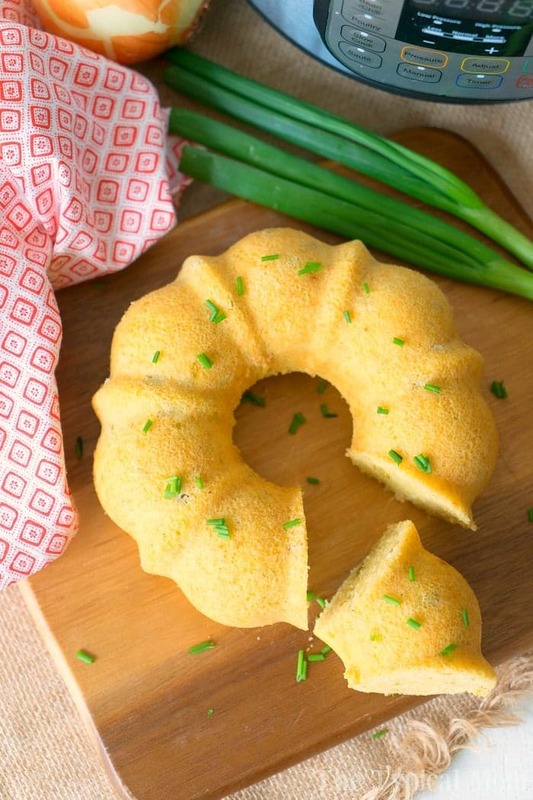 Lower your bundt pan on to your trivet (use a sling so you can lift it back out). Close your lid and steam valve and set to pressure, high, for 35 minutes. Allow to naturally release. Take bundt pan out, remove foil and paper towel and cool on a cooling rack. Gently loosen edges from pan so it will slide out. Put cutting board or plate on top and carefully flip over. Remove bundt pan, cut and serve. I just got an instant pot can’t wait to try this! This cornbread looks delicious! I need an instant pot! The finished product looks fabulous!! Thanks for sharing!!! If you ever get the chance to do a video of making this, that would be awesome! Do you have a video of doing this method for a cake or other bread? Thank you. I haven’t tried it myself but I can’t imagine why not. I would think as long as the amount or measurement of liquid is the same the far percent shouldn’t matter, in fact I’m sure you could use a non dairy milk source too if you chose to, though a nut milk might add a little of it’s own flavor depending on what it is. Wonder if I could cook this in a 6 inch round pan or a 7 inch springform pan. Do you think one of these would work? Yes I am just not sure of the timing, haven’t done that yet. Just make sure it’s not filled over 3/4 full because it does rise. Would use same timing here and check. Let me know how it works!